Proto.io Spaces (https://spaces.proto.io/) is an interactive prototype gallery for you to showcase your work and get inspired from the work of others. Learn more about Enabling Proto.io Spaces for your account. Once you have your Proto.io Spaces account enabled (see Enabling Spaces), you can access your profile page. 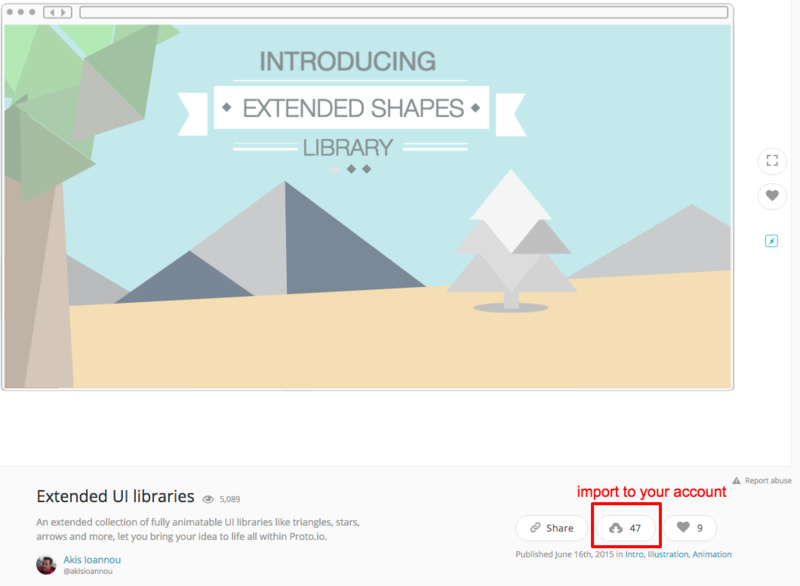 From here you can click on ‘Share your first project on Proto.io Spaces’ to select a project to share. Once you choose a project, it is brought into Spaces and you see a screen where you can edit a title, description and thumbnail to be used in the Spaces gallery, visible to the public. Click on ‘Publish project’ to finalize the process. Proto.io Spaces is a great place to find inspiration and learn from other designers. While you’re browsing through the various projects on Proto.io Spaces, you might find a project you would like to study closer. When you click to preview, just under the preview window, you see the following options: to Share on social media, to import/download and to mark as ‘favourite’. When you click on import/download, you’re asked for your target account (if you have more than one accounts) and then you’ll be asked to confirm this action. After a few moments, you’ll see the project in your Projects list.